Harassment, intimidation, threats are never acceptable, yet working people get only the justice we can afford. That's not right and we're working to change that. 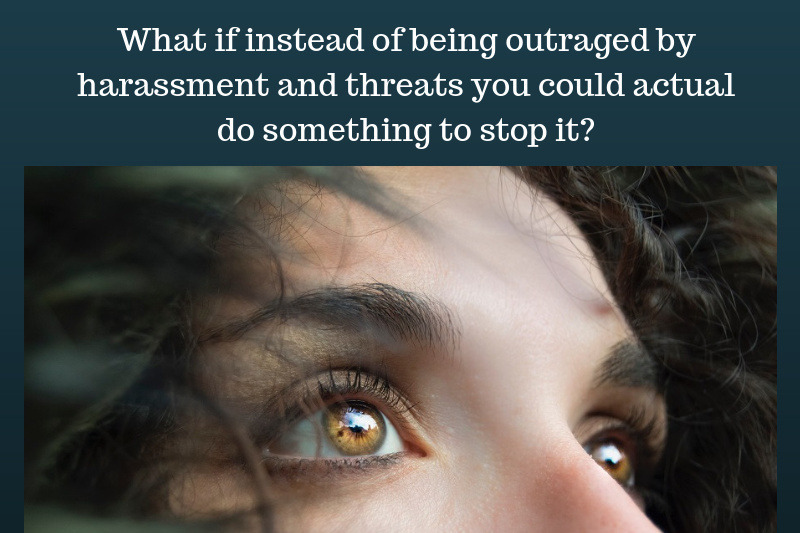 It is time to end the rampant practice of illegal harassment, threats, intimidation and retaliation by people in leadership roles with powerful political connections. We are willing to stand up and say “No more” without fear, but we need help to make this challenge viable. Big legal changes can and do start with a small civil complaint. Our case has the potential to be a catalyst for sweeping changes because the core issues are Free Speech, Defamation, Accountability for Political Parties and Oversight, Ethical Conduct, and Enforcement of such on behalf of state taxpayers. We are two women who started Heroic Media Group, LLC , a small marketing and design business using our expertise to help small businesses thrive and support good people, average citizens, run for office. Our approach helped small businesses achieve brand goals through digital media and we hired contract professionals, supported fellow small businesses, and our local economy while still finding time to give back through volunteer work. We helped candidate clients by providing the same great resources through in-kind donations, enabling them to remain focused on their policy issues, instead of worrying about funding. We were committed to the idea that no one has to be a millionaire to run for office and serve their community.. Ours was honorable work that provided a living and within months, we had contributed well over $5,000 in donated services and time toward making a difference. Not bad for a disabled, minority owned business, right? We began to hear from clients, volunteers, and community members that certain persons in leadership roles within the local political party had made damaging statements about us, our business practices, and our ethical conduct. What followed appeared to be a systematic and unrelenting campaign to defame our business and make outright threats, against us, our candidate clients and retaliate against us and our families. They seemed intent on engaging in retaliation against us in spite of our repeated efforts to diffuse the situation. Despite our several attempts to reach out to these individuals to resolve the issue amicably, the harassment continued. We had no choice but to hire legal help. We spent thousands of our own operating capital on legal fees during the campaign, but it only got worse.After the primary election ended, their harassment continued. Having lost every dime of our investment in our company, our operating capital and finally our business, we recognized that if this could happen to us, it could (and does) happen to anyone. We have attempted to engage local legal authorities to report criminal activity. So far, local police and county officials are not properly investigating claims or passing these off to other agencies with no follow-up. State party officials have not been responsive and claim, “There is no ethics policy,” and, “no harassment policy” in place at a state level to address this behavior. Therefore, we are pursuing a civil case to help bring these issues to the forefront and achieve the justice we seek, not just for ourselves, but help drive change state-wide. You see, our core argument is about holding these people accountable and forcing state officials to do their jobs. As taxpayers, we actually finance political activity and ballot access. And just like any other agency, a system of checks and balances with accountability must be in place. It doesn’t matter where you fall on the political spectrum – those of us without power agree that no person in office, no political leader, has the right to break the law, violate ethics, or engage in retaliation. This is why our story and our case is so important and has the potential to change everything.Please help us champion justice, integrity, transparency. We believe that the evidence we already have and the evidence we wish to obtain can and will be used to prove our claim as well as set precedence to help govern local and state political activity. Harassment, threats, coercion and intimidation have no place in politics. These activities are clear violations of the law. While this is true, it is an ugly fact that pursuing justice is restricted to those who can afford it. We are willing to stand up and so “No more” without fear, but we need help to make this challenge viable. Are you ready to help end “Chicago Politics” and the “Machine” here and elsewhere?You can help change that, right now – today. Any remaining funds will be donated to homeless veterans via the Midwest Shelter for Homeless Veterans ( http://www.helpaveteran.org/) and the Ronald McDonald House Charities ( https://rmhccni.org/). 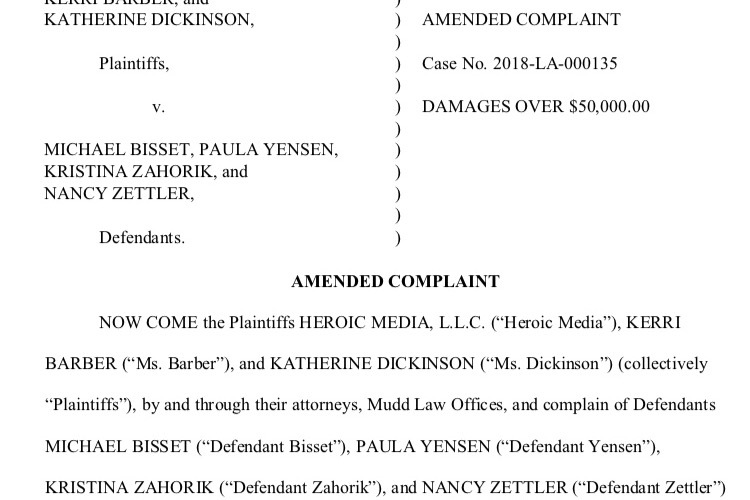 We filed an amended complaint per our judge’s request. We were not aware that it had been made public until, within hours, one witness complained of harassment by an agent of the Defendants. That is not supposed to happen - ever. No witness, on either side, should be harassed or even questioned about this matter. The unabridged truth is what is most important in this matter. We are not afraid to have the whole story told. What do they have to hide? Harassment, retaliation, and coercion are never acceptable. We know this story is complex and confusing as it spans over eighteen months with so many details. One of our fierce supporters suggested writing a narrative about one specific moment. Great idea! We are now so pleased to share with you just one two- hour event in this entire saga to help people better understand what happened to us. Special thanks and appreciation to Undercovered Magazine for the kind editing assistance and publication. Watch the video (30 sec) to see what happened when our County Chair was asked about the Executive Board of our own party removing 20 PCs to rig a vote. We are still in the fight just to get a chance to plead our case. 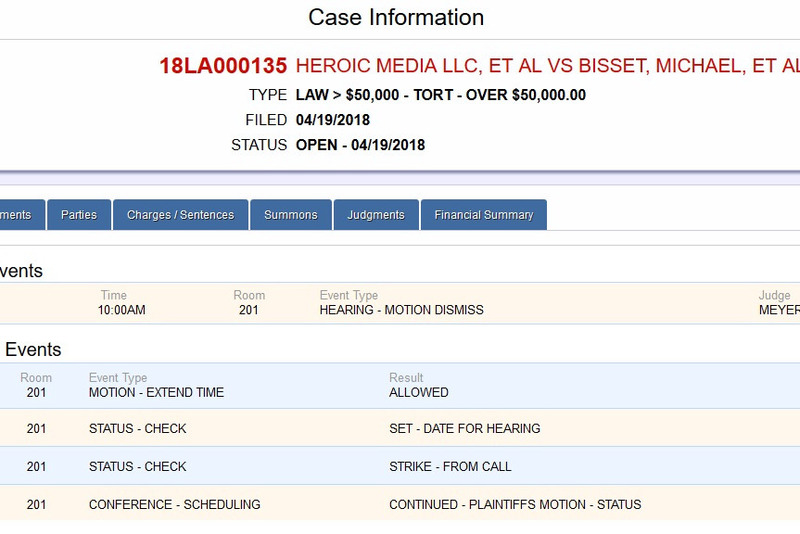 We knew they would file a motion to dismiss, but we didn't know just how low they would actually go. They are arguing that they acting on behalf of our entire party, not as individuals. Ok.... Except that our party colleagues (Central Committee) were never told what was happening and we actually are members of the same party. So, are they trying to implicate ALL of us in ~their~ bad behavior?? 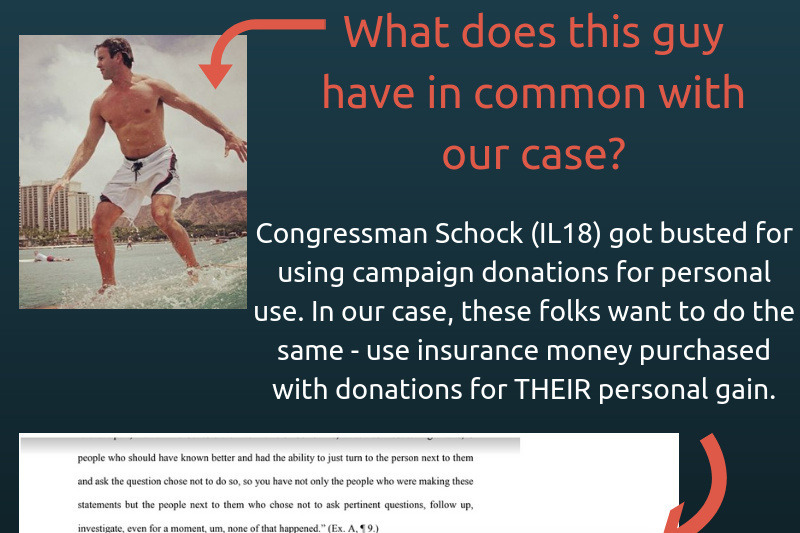 They are also saying they have a right to use funds from an insurance policy we purchased for the party through donations - for their personal legal expenses. Does that seem right to you? Bottom line, the Citizens Protection Act they are using is meant to protect YOU from the same behavior we allege happened to us. Pay attention! The truth of the matter is this, they asked us to amend our complaint and 'join' in suing the insurance company. We aren't chasing money to violate ethics. Our next court date is December 17, 2018. The CPA is designed to stop frivolous lawsuits that limit Free Speech in elections. "The Citizen Participation Act was enacted to protect and encourage public participation in the government. See 735 ILCS 110/5. The Act accomplishes this goal by immunizing citizens from liability for acts in furtherance of the “constitutional rights to petition, speech, association, and participation in government.” 735 ILCS 110/15. The Act provides for expedited court hearings and mandatory attorneys fees for parties that have successfully barred claims under the Act. 735 ILCS 110/20, 110/25. The legislature also made clear that the Act is to “be construed liberally.” 735 ILCS 110/30." (3) the nonmovant fails to produce clear and convincing evidence that the movant's acts were not genuinely aimed at solely prosecuting favorable government action.